With talk about the new TV show “I Survived a Japanese Gameshow” burning up the internet I couldn’t have planned a better time to discuss my recent adventures in Japan. Initially I planned on titling this article “How to get arrested in Japan without really trying” because the hot topic of our gathering of friends and family was my recent sort-of-arrest by the local beat cop. It wasn’t my fault, Ma! I was just minding my own business, sitting on a curb in Kawasaki, Japan at 6am. I was focused on my laptop screen, checking my email with a little Wi-Fi mooched from the local grade school when a shadow passed over me, hesitated, returned and cleared its throat. Looking up, I locked eyes with a frowning policeman. “ここで何やってるのですか？” he said as my brain seized in panic. I knew what he wanted to know. Who am I? What was I up to in the wee hours of the morning, sitting on a curb with my laptop? I was a deer in the headlights. My limited grasp of the Japanese language went into hiding as I searched my brain for a response. “Email! Email!” I blurted out as I scrambled up and turned my laptop towards him, figuring everyone knows the word email. My 6’2”, 210lb. frame towering over him like a redwood didn’t work in my favor, and he jumped back grasping the handle of his nightstick. Long story short, I ended up getting perp-walked back to the family home. The Neighborhood stopped what they were doing and leaned out their doorways to witness the spectacle. They whispered to one another as we passed. “We knew there was something strange about that man, always saying hello and smiling at people…I wonder who he killed? At the family home the policeman agreed to wait at the gate while I went in and woke someone to verify I was not a mass murderer. The neighbor, a woman I had viciously “good morninged” and bared my teeth at many times was talking to the policeman in hushed tones as I went in. When I came out a few minutes later with my very sleepy sister-in-law he was gone. I guess I’d been cleared by the neighbor or some other major villain had struck in the area and drawn him away. This is how the seeds of great family stories are germinated. I am now “he-who-was-brought-home-by-the-police,” a family badge I will wear with honor as I perpetuate and expand on the story until the movie comes out in a theater near you. After everyone at the party had finished laughing about my unfortunate encounter I announced I’d like them to participate in a tasting of a handful of American Northwest Craft Beers I’d brought for just this purpose. I had a captive audience, and lots of food; it was too perfect an opportunity to waste. I explained, as those who spoke English translated, that we would sample small quantities of the beers with and without food and then discuss how they taste and if we like them or not. Seemed simple enough and the Japanese, as a culture, are well versed in the art of food and beverage evaluation. The beers I’d brought were: Rogue Dead Guy Ale, Ninkasi Tricerihops, Rogue Hazelnut Brown Nectar, Alaskan Smoked Porter, Rogue Chocolate Stout, Tracktown Honey Orange Wheat, and Rogue Brewer’s Ale. I know what you’re thinking. I went a little heavy on the Rogue. During the selection process I chose beers that I felt would be more interesting to my audience and the Rogue styles seemed to jump out at me. Also, Rogue is available in the Tokyo area so they could buy more if they liked it. Japan, more so than anywhere I’ve ever been, is a food culture and the Japanese seem keen on trying and evaluating anything and everything. Japanese travel agencies use food and beverage as one of the main engines of international travel. Whereas America is famous for food consumption, Japan is famous for savoring and evaluating each and every element of the meal. Watch one day of Japanese television and you’ll get an idea of how prevalent matters of the palette are. My research says TV food shows account for an estimated 35 to 40 percent of domestic programming. Talk shows seem to take up a large chunk of the rest and those programs all seem to have a cooking segment or fieldtrip segment, where someone goes somewhere to eat or drink something specialized to a region. After showing all aspects of preparation, the camera goes into a close up and they make the food look extra delicious, giving whatever is being consumed a big jiggle and then following it from plate to mouth after which the taster exclaims, “Oishii desu!” Delicious! One of these shows was on when a familiar face filled the screen. Harrison Ford was on a TV show plugging his new Indiana Jones movie. After they talked about the movie Harrison had to judge a cook off where 3 sets of chefs prepared special entrees and Mr. Ford had to taste each one, comment on the dish, then choose his favorite. I’ve never seen Harrison Ford more uncomfortable and out of his element as he tasted each dish, but he handled it like a pro. The camera zoomed in and followed the food to his mouth and we all held our breath as he chewed and chewed. His face didn’t betray anything. He could have just as easily been gumming creamed corn. He could use a couple “Ummmm, Ahhhhh” lessons in Japanese food tasting etiquette. Finally he was able to clear his mouth and exclaim “Oishii desu!” Way to go Harry, you pass. Japan’s obsession with food even crosses lines into other TV genre’s. 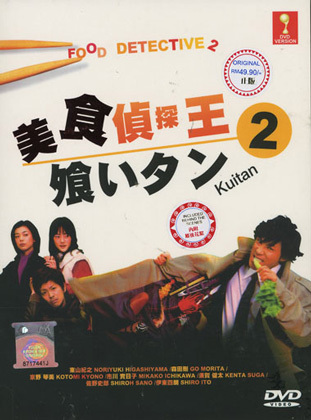 There’s a Japanese TV mystery drama series called Food Detective 2 (Kuitan 2), where the “Big-Eating” division of the “Holmes Detective Agency” lead by detective Seiya Takano, finds food somehow plays a part in solving every case! Think “Monk” with food rather than OCD. I think you get the picture…let’s get back to the beer. Though Japanese Craft Beer has made great strides in the new millennium they capture a very small percentage of the overall market share. Most Japanese drink the mainstream lagers and happoshu produced by the big breweries Asahi, Kirin, Sapporo, and Suntory. This would be the first time most of the people in the room had ever tasted craft beer. I decided to start light and move gently towards the stronger, more complex beers. The first beer sampled, Tracktown’s Honey Orange Wheat, from Eugene City Brewery where I live. 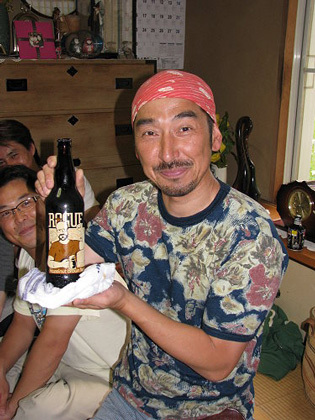 The beer delighted the group and there was a lot of chatter about its soft sweetness, the general consensus, “Oishii desu!”. Rogue Hazelnut Brown Nectar met with a similar reaction. It was the introduction of the Rogue Chocolate Stout that the group started to splinter, some finding the chocolate sweetness behind the slightly bitter finish, others blanched at the tasted malt. The Alaskan Smoked Porter, one of my personal favorites was unanimously rejected; they did not like the smoked flavor. I followed up with another favorite of mine, Rogue Dead Guy Ale, a german-style maibock. A good 90 percent of the group said they liked it very much and they especially liked the Dead Guy Logo. 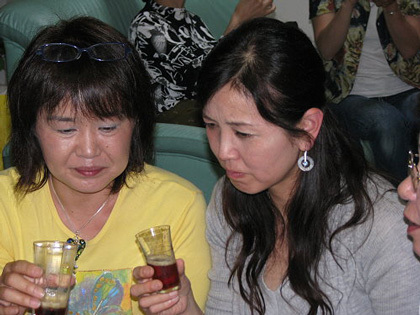 I took a deep breath as my niece, Minami, made the rounds and rinsed our glasses. I had two beers left, Ninkasi Tricerihops, a double IPA and a great example of Northwest hopitude, and Rogue Brewer’s Ale, a strong ale with tons of hop flavor and a huge malt backbone. “These people aren’t ready for this.” I thought as I filled the glasses and passed them around. I was right, I didn’t even have to ask, the scrunched up faces told the story. Though a few finished their Brewer’s Ale, they all rejected the over-the-top hoppiness we take in stride here in the Northwest. 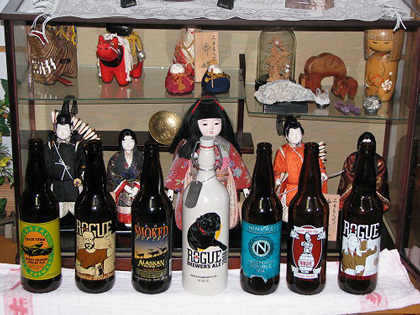 How the beers ranked in taste with my non-craft beer savvy group – Honey Orange Wheat got the big “Oishii desu!” award, followed closely by Hazelnut Brown Nectar, Dead Guy Ale, Chocolate Stout, Smoked Porter, Brewer’s Ale, and Tricerihops. My results indicate, and this is a very small sampling and not even on speaking terms with anything scientific in nature, that for now Wheat’s, Sweets, and Session beers would be my choice for winning Japanese consumers over to craft beer. I suspect, just like most people who choose the craft beer path, their tastes will develop over time and before you know it they’ll be clamoring for the bigger, more complex offerings we enjoy here in the Good old US of A. As long as there’s some left for me I’m all for it. 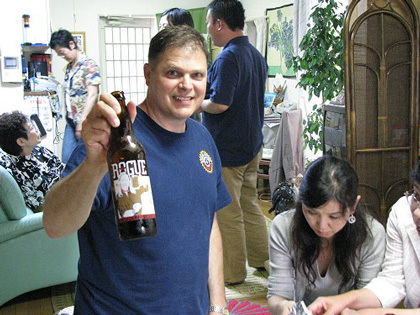 To see more pictures of our American Beer Tasting in Japan click link below.